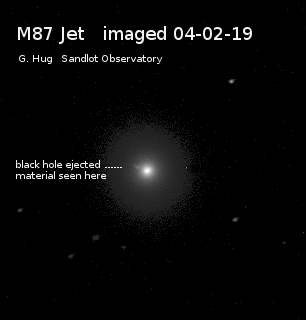 Here’s M87 taken with my 22″ Reflector and an ST-8 CCD camera. The image show the jet of material traveling at some percentage of the speed of light while being squeezed out before reaching the event horizon . This does correlate with the black hole at M87 center that was recently ‘imaged’ and publicized. 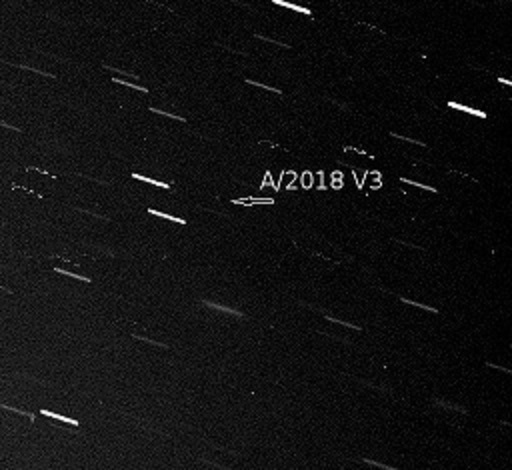 The ST-8 image taken at Sandlot Observatory was imaged on 04-02-19. 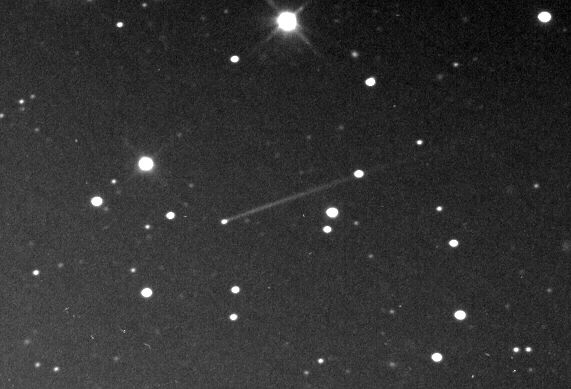 A long known asteroid suddenly sprouted a long narrow tail. This is a 22 minute (45 secs x 30) cropped imaged taken with the Tombaugh Reflector at Farpoint 01-10-19 about 8:00 U.T. The tail was visible faintly in each of the 45 second images. This asteroid may have developed the tail through an impact with another rock. [T08] ATLAS Mauna Loa images 1-5.5 U.T. showed a comet like tail extending from the asteroid and comments started flowing on mpml and comet ml list servers. A couple of months ago it went through a 2 magnitude outburst and is still at that level as of last night. 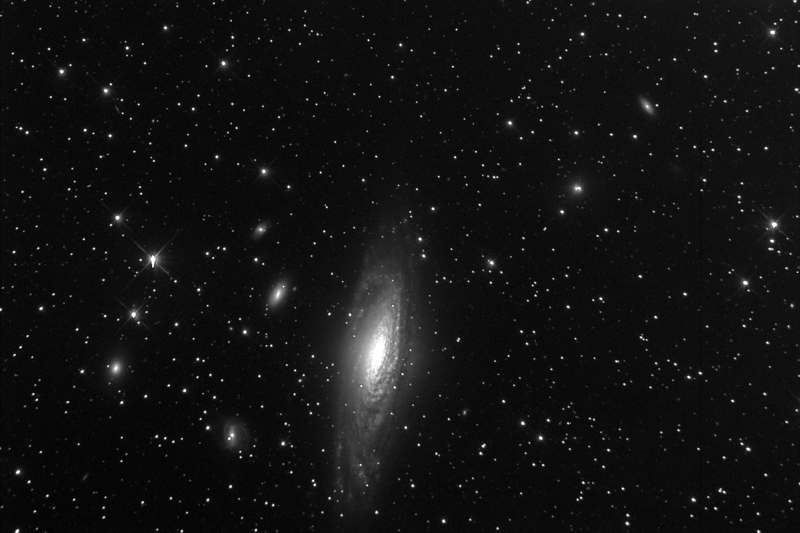 Anyway some of the objects in our NEO follow-up program are as faint or even a bit dimmer than 21.5 V magnitude. Even with the arrow pointing to the object its hard to see. Only with consistent movement in the predicted angle is it identifiable as a target. 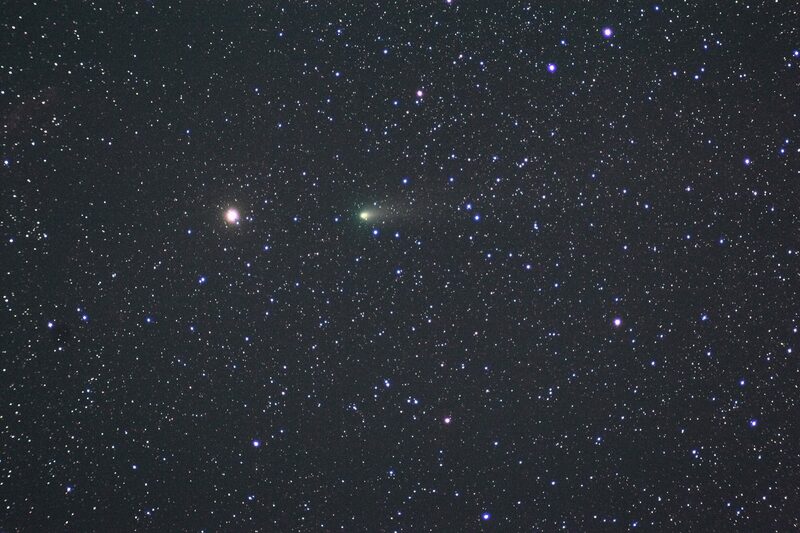 This image is a combination of 14 – 2minute images taken on the night of 11-14-18 and severely cropped. At the time the MPC listed it as 21.6 V magnitude. It would also be easier to see inverted (dark stars on white background) . During a recent visit to England I had an opportunity to visit with Peter Birtwhistle at his home at Great Shefford. Peter is one of the most prolific observers for NEO follow-up in the world. Here we are in front of his backyard observatory (MPC J95) which houses a 16″ LX200 SCT in the small town of Great Shefford. He has developed his own software that allows manipulating image files to produce accurate results of NEO targets. 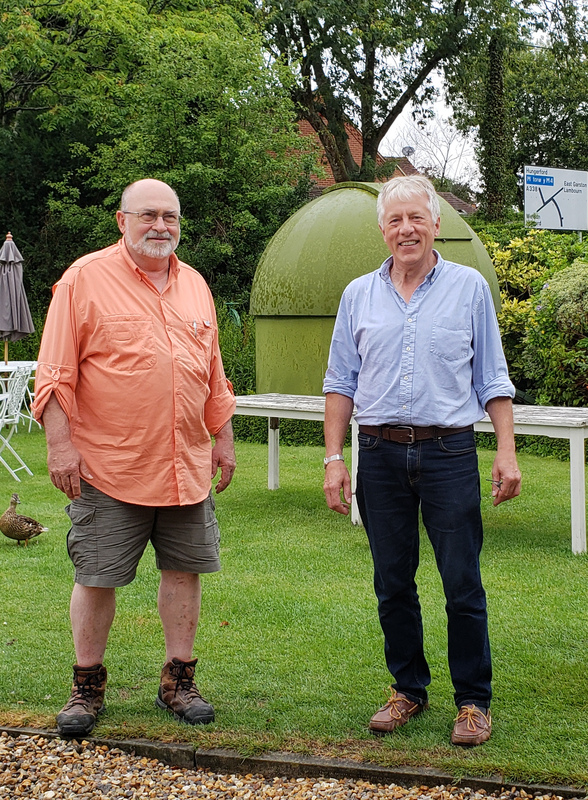 Peter Birtwhistle and I at his backyard observatory in Great Shefford, England. This is an image taken just before dawn 07-11-18 with the new (to us) STL 6303E camera mounted on the Tombaugh .7 meter Reflector at 2 bin pixels ( 18 micron). I’m making this post to test and announce automated Twitter and facebook announcements when a new NEKAAL Observer post is made. So if you follow NEKAAL on Facebook or twitter you should get notified of new posts. I still have a lot to learn, but thought it might interest others to know how I put together some photos that were taken October 15th this year (shown above). 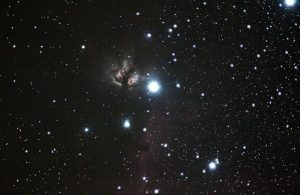 These were taken using a refractor and an SLR camera, mounted on a fork mount. One exposure on its own doesn’t look so great. So we need to combine them. To combine the images I used Siril. Siril is laid out so that each tab from left to right is the next step in processing your image. First you do File conversion. I convert the raw image files from the SLR (CR2 files in my case) to the FIT’s file format Siril likes. I make sure to check “Demosaicing” as that is how the colors are extracted. The colors in the the raw file from the SLR are stored as a color mosaic after going through a Bayer filter. You can learn more about what that is here and here. I add all the files I want to use for a particular image and I convert them all at once. It then puts them all in a sequence. I make sure to include all the images I converted in that Sequence. The next step is Registration. Registration basically aligns all the images based on the stars in the image. 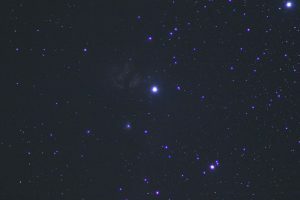 If the center of a star is at a certain place in one image, I want it to be at that spot in all my images. In each exposure the object is shifted a little bit, and I need them to be aligned before stacking. You can select which image is your reference image in the Sequence tab before registration. I then stack all those registered images into one image through the Stacking tab. Then I save it as a tif file (16 bit sample format) to be processed in Darktable. 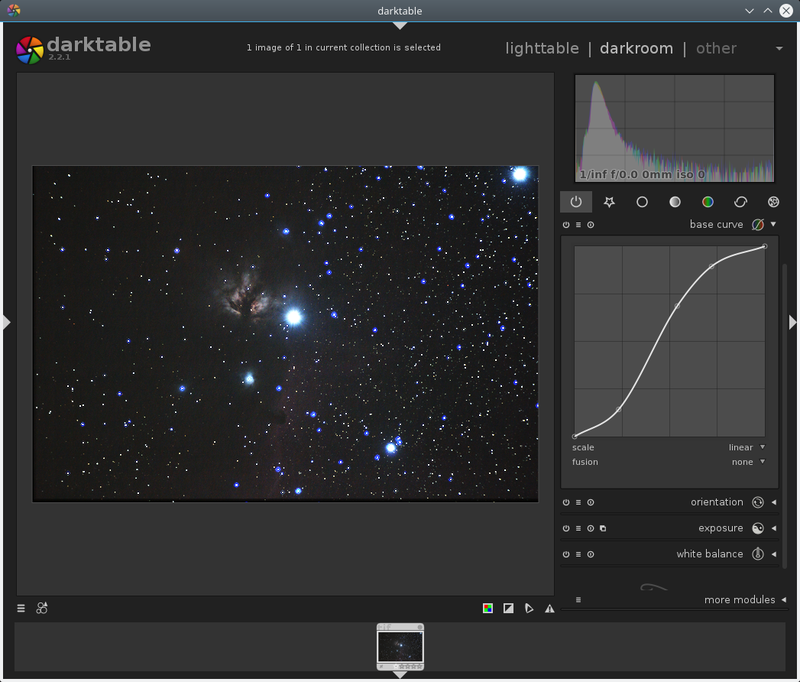 White Balance – I make sure the background is black and the center of most stars are white. Mainly this can be done by making sure the large humps of the color channels in the graph shown in the top right have their peaks overlapping. Exposure – I modify this to try to bring out more detail. It is the background (black) and range (exposure) of the image. Base Curve – This is a more precise way to bring out details in a similar way to exposure. In the screen shot above you can see I made the curve looks like an S. I’m trying to brighten the dim details but also keep the bright details so it doesn’t look over-exposed. This is similar to what DDP (Digital-Developoment Process) does but without the edge emphasis part. In the future I will probably attempt to do true DDP. Once it looked the best I could make it, I exported it to a jpg to then further process it in The Gimp. 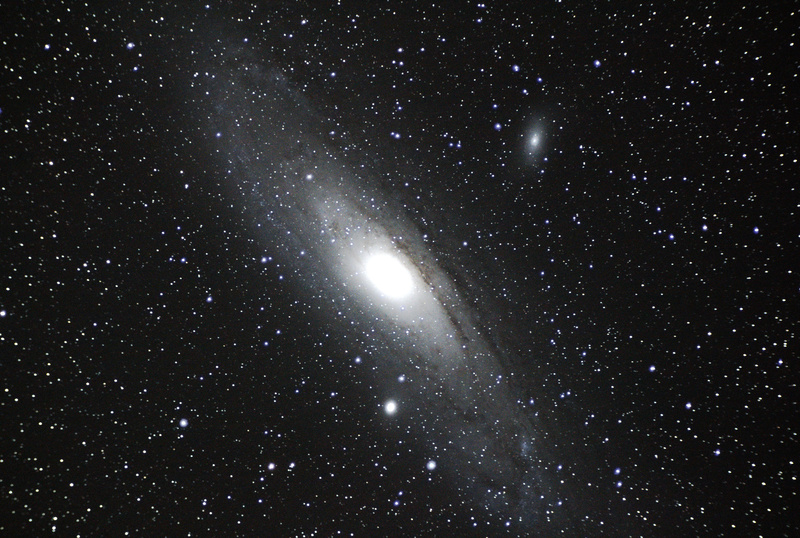 Because the images were taken with a refractor with chromatic aberration, there are purple or blue (after white balance) rings around the stars. 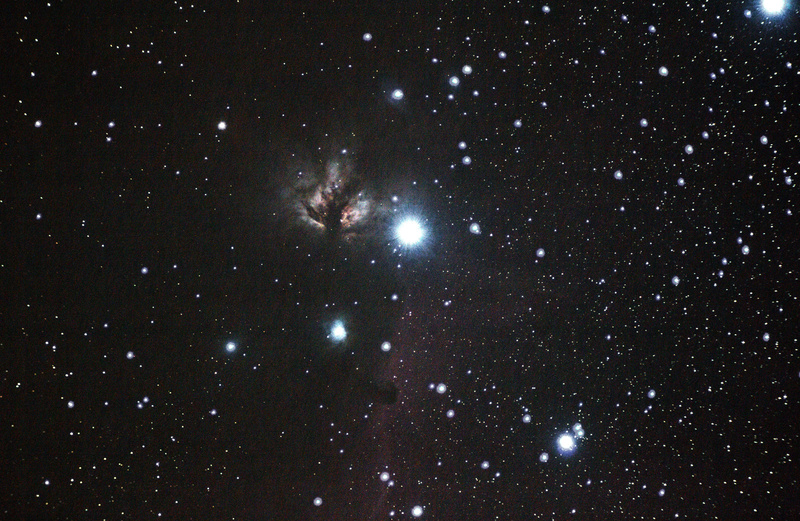 I attempted to correct this by using a “CCD Camera Fringe Removal” Gimp script. 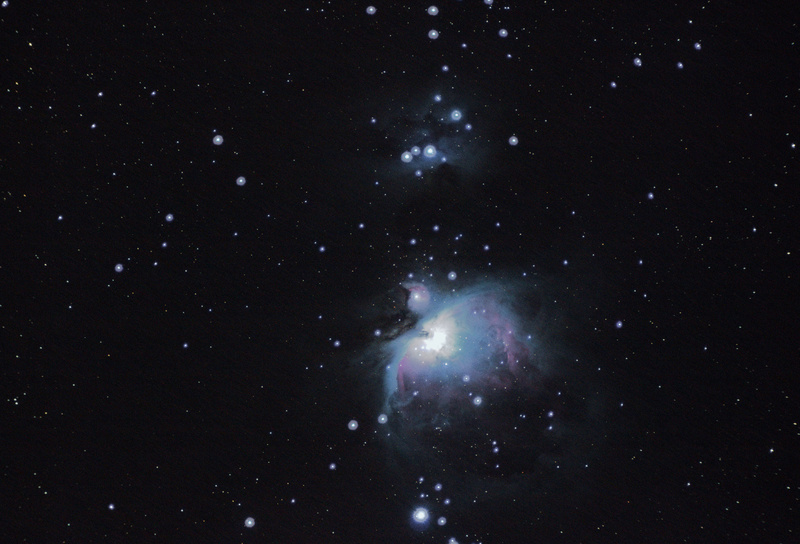 This is not a perfect solution and looks a little weird in some of the images (like Orion). 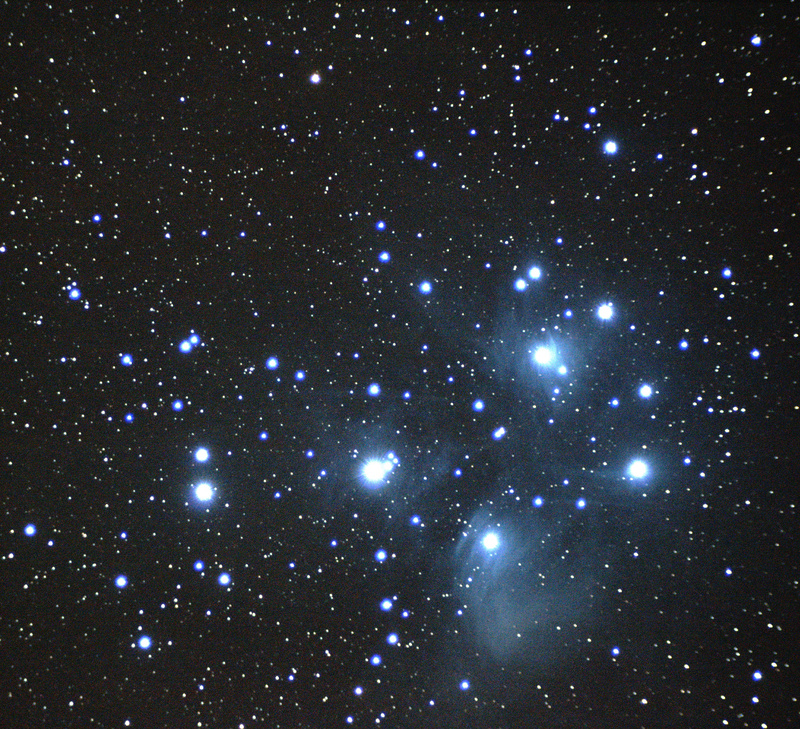 It also plain doesn’t work on a object like Pleiades with a lot of blue in it. Gary mentioned to me that some people use IR and UV cut filters to bring it down. The camera already has an IR-cut filter, so I may try a UV cut filter in the future. After that I cut and resized the image to my liking. The edges of the images were underexposed because not all images had data around the edges after registration. I also used the brightness and contrast tool as a final tweak. 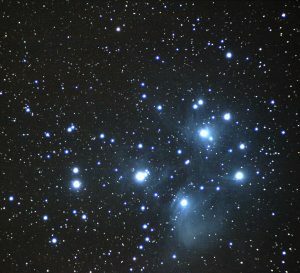 I hope this article was useful if you are getting started in processing astrophotography images. Canon EOS Rebel T3i (600D) SLR Camera at prime focus* Disclaimer: Russell Valentine, the author, has a financial interest in StarSync Trackers LLC. Graham Bell originally registered NEKAAL up as a Amazon smile charity. For one reason or another it had gone away. Janelle has set it back up. 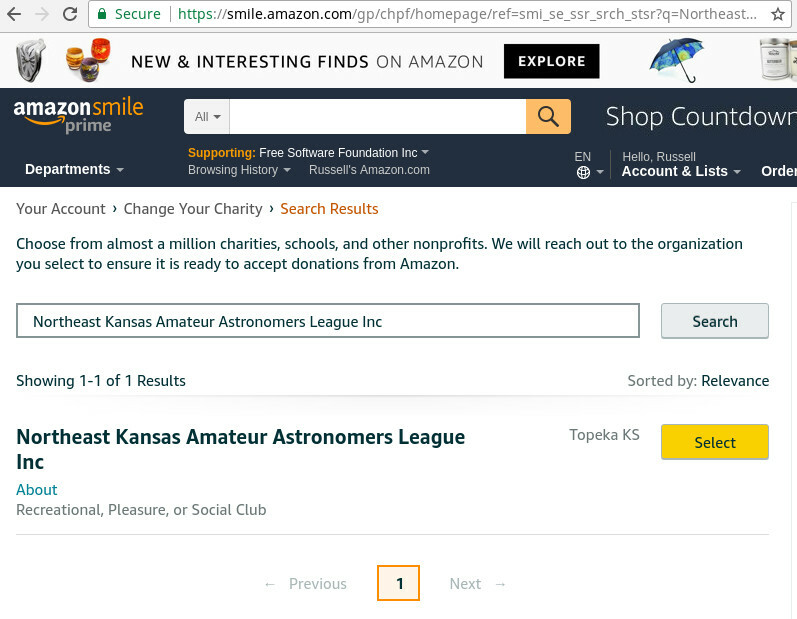 So if you wish you can set your charity to NEKAAL at smile.amazon.com and 0.5% of eligible purchases made by you through smile will be sent to NEKAAL with no extra cost to you. 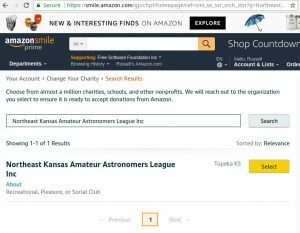 The easiest way to find it, is to search for “Northeast Kansas Amateur Astronomers League Inc” in the charity search box.